Draft: 2010, Los Angeles Angels, 1st rd. athletes by donating athletic shoes to charitable organizations and helping to raise money for Soles4Souls Inc... 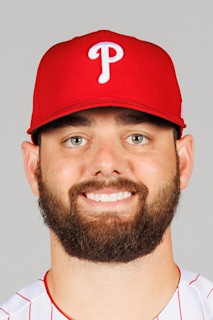 Son of Steve Bedrosian, who pitched 14 big league seasons with Atlanta, Philadelphia, San Francisco and Minnesota...Won 1987 National League Cy Young Award with Phillies. Established new career highs in games (71), innings pitched (64) and strikeouts (57) for fifth consecutive season with Angels... Stranded 21 of 28 inherited runners... Stranded rate of 75% was best in career... Recorded only save of season Apr. 24 at HOU with 1.1 scoreless innings... Marked third save of four-or-more outs in career... Established franchise record for a right-handed pitcher with 46 appearances prior to All-Star Break (previous was 45 by Francisco Rodriguez in 2008)... Allowed just one earned run during 18 game stretch from June 1- July 11 and had a 0.49 ERA (18.1 IP - 1 ER) in that span...Was not charged with an earned run in 12 straight appearances from June 15 - July 11... Was 3-0 with a 2.43 ERA (37 IP - 10 ER) across 36 appearances at Angel Stadium, compared with a 2-4 record and 5.67 ERA (27 IP - 17 ER) on the road. Set career highs in wins (6), saves (6), games (48), innings pitched (44.2) and strikeouts (53) for Angels ... Matched single game career-high in innings pitched (2) and recorded first career six-out save on Apr. 18 at Houston ... Opened the year as the closer and tossed 6.2 scoreless innings across first six appearances...Converted three of four save opportunities in that span, before suffering injury on Apr. 21 vs. Toronto ... Missed 53 games on disabled list from Apr. 22-June 17 with a right groin strain...Appeared in four games (one start) with Adv.-A Inland Empire on rehab assignment and allowed three runs in 3.2 innings pitched with seven strikeouts ... Did not allow an earned run in 12 games (11.2 IP) from July 30-Aug. 25, while going 1-0 and converting all three save opportunities ... Held opposing hitters to a .158 (3/19) batting average against with two outs and runners in scoring position ... Was Angels losing pitcher in back-to-back appearances on July 14 and July 18 after previously not taking a loss since June 19, 2014 at Cleveland. Set career-highs in games (45), innings pitched (40.1) and strikeouts with career-best 1.12 ERA (40.1 IP - 5 ER) for Angels...Earned fi rst career save on Aug. 2 vs. Oakland aft er striking out all three batt ers faced...His 0.47 road ERA (19 IP - 1 ER) led Majors (min. 15 IP) and established new Angels single-season record...Had streak of 25 consecuti ve appearances without being charged with a run from June 3 - Aug. 2...Marked longest such streak of carer and fourth longest in Angels history...Collected career-high fi ve strikeouts on May 2 at Milwaukee...Recorded 15 of 18 outs via strikeout during six game scoreless stretch from July 19 - Aug. 2...Had 14 game (12.1 IP) streak without allowing an earned run from Apr. 8-May 22...Missed fi nal 54 games of season aft er being placed on disabled list Aug. 9 (retro to Aug. 4) with right middle fi nger fl exor tenditi s)...Underwent embolectomy on right arm in September to remove blood clot. Pitched in 34 games across four stints with Angels, compiling a 1-0 record and 5.40 ERA (33.1 IP - 20 ER) with 34 strikeouts and 19 walks. Began season with Triple-A Salt Lake...Tossed eight scoreless innings across first four outings of year and received first Major League promotion of year April 21. Across four stints with Salt Lake, pitched to a 1-1 record and 2.78 ERA (35.2 IP - 11 ER) with three saves, 42 strikeouts and 14 walks. Started big league season with 8.2 scoreless innings pitched at home across his first seven outings at Angel Stadium. Earned first win of Major League career August 5 vs. Cleveland aft er tossing a perfect ninth inning...Angels rallied for three runs in bottom of ninth inning to win...Taylor Featherston scored on wild pitch for walk-off victory. Stranded 15 of 23 inherited runners on the season. Entered season ranked as Angels #3 prospect according to Baseball America. Appeared in 17 games across five stints with Angels in first Major League season and pitched to an 0-1 record with a 6.52 ERA (19.1 IP - 14 ER)...Opened season with Adv.-A Inland Empire and did not allow a run in five appearances (5.2 IP) before being promoted to Double-A Arkansas April 17...Went 0-0 with one save in his five games with 66ers...Allowed just one hit and two walks while striking out 15...Pitched in 30 games across three stints with Arkansas and went 1-0 with 15 saves and a 1.11 ERA (32.1 IP - 4 ER) while recording 57 strikeouts and 10 walks...His 15 saves ranked tied for fifth in the Texas League...Did not allow a run in 16 of last 17 outings with Arkansas...Appeared in eight games across two stints with Triple-A Salt Lake...Pitched to a 1-1 record with two saves and a 7.71 ERA (7 IP - 6 ER)...Did not allow a run in six of eight appearances with Bees...Made Major League debut June 3 at Houston...Tossed one scoreless inning and struck out first batter faced (Jonathan Villar)...Did not allow a run in each of first six home games to start Major League career (8 IP)...Entered year ranked by Baseball America as Angels #10 prospect. 17 de junio de 2017 Los Angeles Angels activan a RHP Cam Bedrosian de la 10-d&iacute;a lista de lesionados. 2 de junio de 2017 Los Angeles Angels envian a RHP Cam Bedrosian una asignaci&oacute;n de rehabilitaci&oacute;n a Inland Empire 66ers. 22 de abril de 2017 Los Angeles Angels ponen a RHP Cam Bedrosian on the 10-d&iacute;a lista de deshabilitado. Right groin strain. 3 de octubre de 2016 Los Angeles Angels activan a RHP Cam Bedrosian de la 15-d&iacute;a lista de deshabilitado. 9 de agosto de 2016 Los Angeles Angels ponen a RHP Cam Bedrosian on the 15-d&iacute;a lista de deshabilitado retroactivo al August 4, 2016. Right middle finger flexor tendinitis. 29 de abril de 2016 Los Angeles Angels llamado RHP Cam Bedrosian de Salt Lake Bees. 9 de abril de 2016 Los Angeles Angels opcionado RHP Cam Bedrosian para Salt Lake Bees. 16 de agosto de 2015 Los Angeles Angels llamado Cam Bedrosian de Salt Lake Bees. 9 de agosto de 2015 Los Angeles Angels opcionado RHP Cam Bedrosian para Salt Lake Bees. 3 de agosto de 2015 Los Angeles Angels llamado Cam Bedrosian de Salt Lake Bees. 1 de julio de 2015 Los Angeles Angels opcionado RHP Cam Bedrosian para Salt Lake Bees. 24 de mayo de 2015 Los Angeles Angels llamado Cam Bedrosian de Salt Lake Bees. 29 de abril de 2015 Los Angeles Angels opcionado RHP Cam Bedrosian para Salt Lake Bees. 21 de abril de 2015 Los Angeles Angels llamado Cam Bedrosian de Salt Lake Bees. 28 de marzo de 2015 Los Angeles Angels opcionado RHP Cam Bedrosian para Salt Lake Bees. 13 de octubre de 2014 Cam Bedrosian estado en la lista cambian a por Los Angeles Angels. 2 de octubre de 2014 Los Angeles Angels reasignado RHP Cam Bedrosian a las ligas menores. 2 de septiembre de 2014 Los Angeles Angels llamado RHP Cam Bedrosian de Salt Lake Bees. 23 de agosto de 2014 Los Angeles Angels opcionado RHP Cam Bedrosian para Salt Lake Bees. 21 de agosto de 2014 Los Angeles Angels llamado Cam Bedrosian de Salt Lake Bees. 10 de agosto de 2014 Los Angeles Angels opcionado RHP Cam Bedrosian para Salt Lake Bees. 3 de agosto de 2014 Los Angeles Angels llamado Cam Bedrosian de Arkansas Travelers. 10 de julio de 2014 Los Angeles Angels opcionado RHP Cam Bedrosian para Arkansas Travelers. 8 de julio de 2014 Los Angeles Angels llamado Cam Bedrosian de Arkansas Travelers. 21 de junio de 2014 Los Angeles Angels opcionado RHP Cam Bedrosian para Arkansas Travelers. 3 de junio de 2014 Los Angeles Angels seleccionado el contrato de Cam Bedrosian de Arkansas Travelers. 17 de abril de 2014 RHP Cam Bedrosian asignado a Arkansas Travelers de Inland Empire 66ers. 2 de marzo de 2014 RHP Cam Bedrosian asignado a Los Angeles Angels. 13 de agosto de 2013 RHP Cam Bedrosian asignado a Inland Empire 66ers de Burlington Bees. 13 de julio de 2012 Cedar Rapids Kernels activan a RHP Cam Bedrosian de la 7-d&iacute;a lista de deshabilitado. 7 de julio de 2012 Cam Bedrosian estado en la lista cambian a por Cedar Rapids Kernels. 6 de julio de 2012 Cedar Rapids Kernels ponen a RHP Cam Bedrosian en la 7-d&iacute;a lista de deshabilitado. 30 de abril de 2012 RHP Cam Bedrosian asignado a Cedar Rapids Kernels de AZL Angels. 15 de julio de 2010 Cam Bedrosian asignado a AZL Angels de Los Angeles Angels. 14 de julio de 2010 Los Angeles Angels firmado RHP Cam Bedrosian.